So while the old Intel NUC machines served me well for the last several years. They certainly don’t compare to the power of this new server. A single Xeon E5-2650 v2 CPU a far better benchmark compared to all three of the NUC’s combined and this server has dual CPU’s. CPU is certainly no a concern. 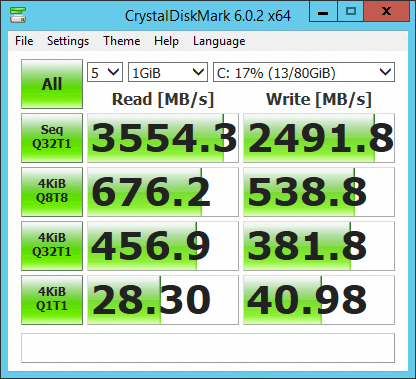 Thanks to the new local storage, virtual machines boot up nearly instantly. 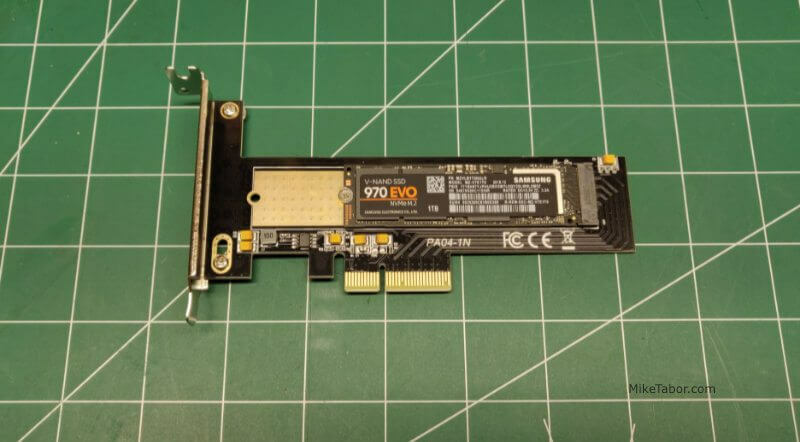 The Samsung 970 EVO is INSANE! The Synology NAS is now used to store personal documents and photo’s that are sync’ed to my multiple devices using Synology Cloud Station Drive or DS Photo – I really like that pictures from my phone are automatically sent to my Synology. It also stores my movies for my Plex media server and serves as a local backup repository. All of the Ubiquiti UniFi network gear is all managed by an Ubiquiti Controller hosted on a Linode VPS. VLAN 1 – Main network where my PC, vCenter, PLEX, and so on reside. VLAN 10 – Guest Wifi Network. VLAN 20 – Internet of Things for my thermostat and Amazon Dot (which is never use). VLAN 30 – Lab network for machines I don’t want necessarily on the main network. VLAN 40 – Pentest network for the penetration testing VM’s. Yeah I know, I still have some “N/A” icons. Maybe one of these days I’ll upgrade to a Ubiquiti Security Gateway. Right now the EdgeRouter X is working just fine. 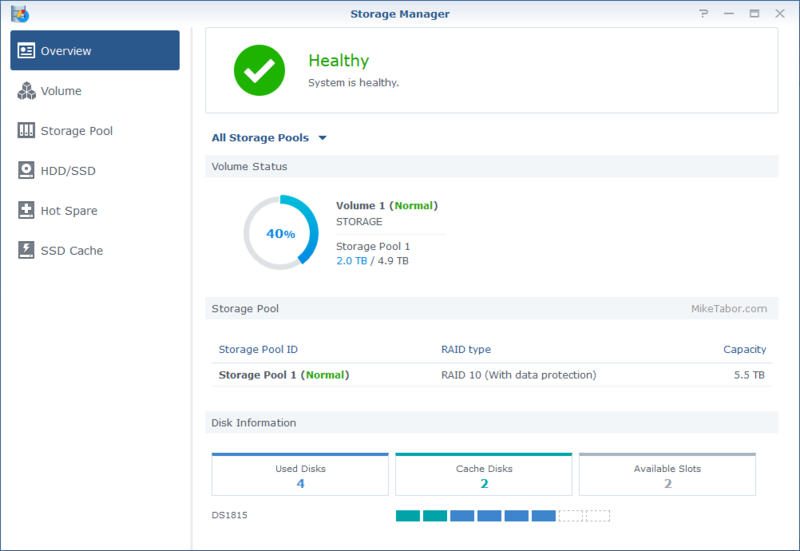 To backup the virtual machines in the lab I’m using Altaro VM Backup, which backs up the VM’s stored on the Samsung SSD’s to a folder on the Synology NAS. 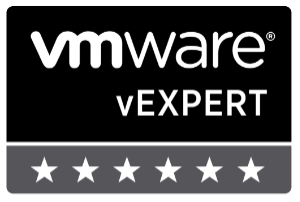 Altaro offers a free NFR license to vExperts as well as a free (2VM per host) license to everyone. You can download it here. 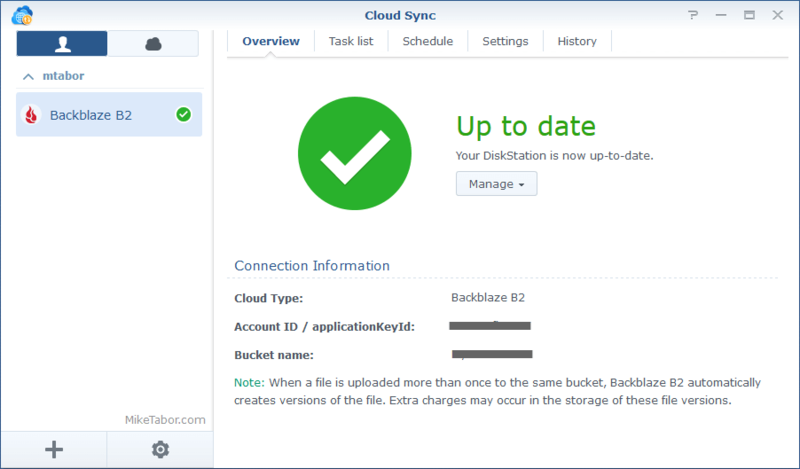 Synology Cloud Sync is used to backup various folders on the NAS to Backblaze B2 which is super inexpensive. Just over 400GB is being backed up to Backblaze for less than $2.00 a month. I believe that pretty well sums up the new ESXi home lab. If you have any questions or want more details around something please leave a comment below or Tweet me at @tabor_mike and I’ll be happy to talk. I have a very similar setup. I use a full Ubiquiti setup as well as a 3 node Proxmox cluster ( 3 8 core xenon desktops with 32GB each) with a Synology DS1518+ with two expansion bays as the datastore. It works out surprisingly well! 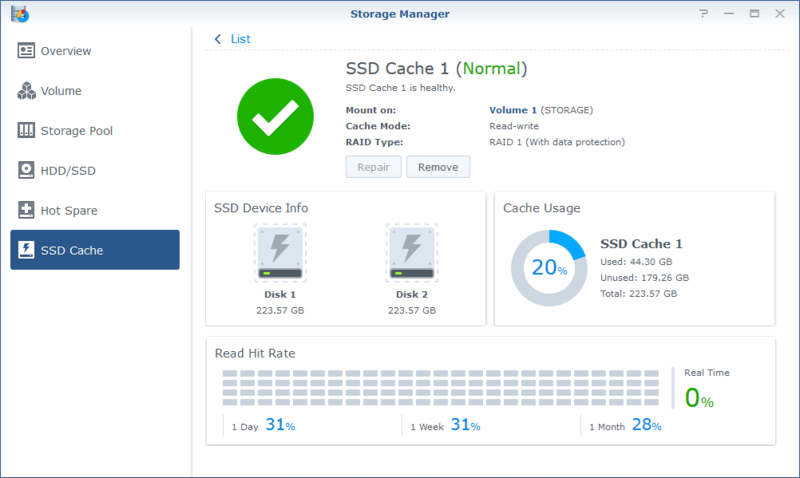 I currently use crashplan to backup my Synology but will have to look into Backblaze since it runs natively on the Synology. Ron I think you’ll like Backblaze. It’s been very reliable for me and for my amount of storage needed has saved me money. It’s also very easy to schedule when the sync happens within the Synology UI. Van i have more Details? How do you Store it in 19“? I’ll be happy to share more details! I thought about putting this in a small rack or even building my own rack. I even went so far as bought the rails to do so but decided not to do either. Instead the server is sitting on a shelf out in my garage. The garage is insulated and even has a small air conditioner. Obviously not as nice or steady as an actual server room, but should do just fine for me home lab needs. Looks like a small production setup to me except for those samsung ssd’s. Am I wrong? Why two switches if everything is internal on a single host? Keep all of the routing internal and use NSX? Kasey, I am using two switches due to the location of the server. My main switch and all the hardwired runs go to one part of the house and the server and a couple additional IP cameras run into the garage. Thus the smaller switch out there. The two switches are connected via a Cat6 run. On the VMware compatibility site I’m seeing the R720 only supports up to ESX 6.5U2. Are you running 6.7U2 (latest at this time) without issues on the R720? I know servers typically work for quite a while as I just now got stopped out with my DL360 G5 on 6.5 and couldn’t go to 6.7. 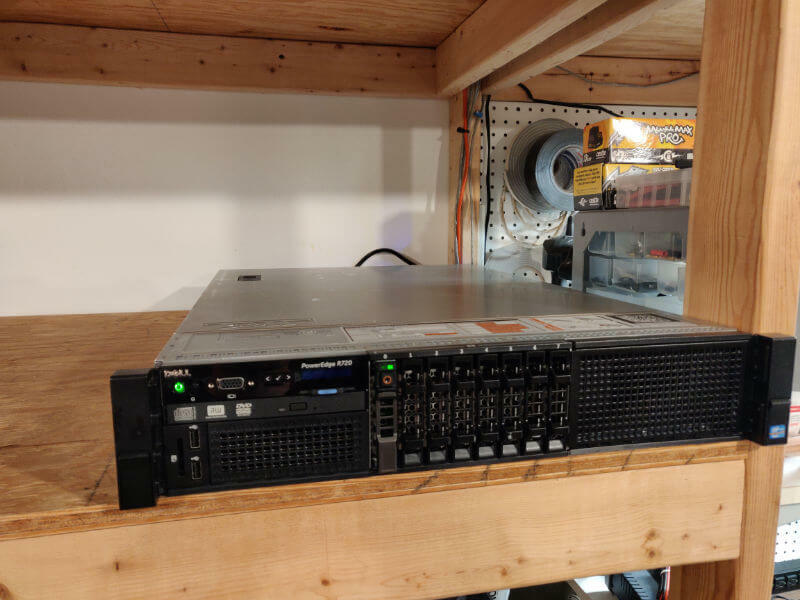 In looking at my own lab upgraded I wanted to make sure I hopefully had some longevity to continue to run the latest ESX versions. 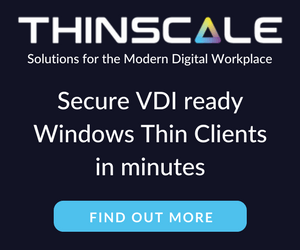 Brian, the VMware compatibility is showing what has been certified compatible. The R720 is an older unit and Dell likely has no intentions in getting it certified. I have been looking for R720. My only concern is the power consumption and noise. How much would it cost per month if R720 is on 24/7 ? Appreciate if you could provide the feedback. Prab, cost is going to depend on how much you pay per kilowatt in your area. When the R720 was connected to my kill-o-watt meter it was averaging around 130 watts. For my area it’s around $100 a year. This is about a $75 increase, per year, over what I was paying with my 3x Intel NUC’s.